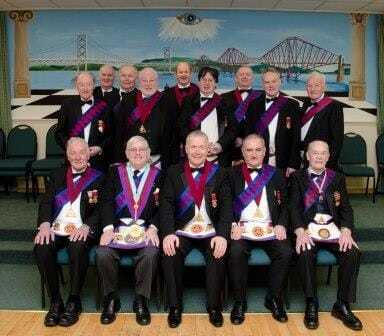 Welcome to the Queensferry Royal Arch Chapter number 389 webpage and I hope you find your visit interesting and worthwhile. What is Royal Arch Freemasonry ? The value of royal arch Freemasonary will be justly appreciated by all who are exalted to that most sublime degree, particularly by those who are seeking to complete their masonic education. It reveals the full light of ancient craft masonry and presents it as a complete system in accordance with the original plan, and confers at last the rights and light of a master mason in fact as well as in name. It truly leads to a fuller understanding of the purposes and spirit of freemasonry, for standing upon this towering summit we are able for the first time to perceive the completeness of the ancient craft and to understand how all its forms and ceremonies, from the entered apprentice to the master masons degree, are the preparation for the final goal, the most sublime degree of royal arch mason. If you have obtained your mark degree in your mother lodge andwould like to continue your masonic journey, you may wish to consider joining the Queensferry Royal Arch Chapter. This year is a very important one for the Queensferry Royal Arch Chapter No 389, as on 1 March 2014 it celebrates its centenary with a special re-dedication ceremony conducted by the Supreme Grand Royal Arch Chapter of Scotland, followed by a Centenary Dinner. If you are an RAC Companion and would like to attend this historic event, please contact Raymond King for tickets. On Saturday 1 March 2014, the lodge room in Queensferry’s Masonic Hall was packed with companions to witness the Centenary re-dedication ceremony of the Queensferry Royal Arch Chapter No 389. MEC Raymond King along with the office-bearers of the Queensferry Royal Arch Chapter welcomed visiting companions travelled from far and wide, to share in the celebrations. The Grand 1st Principal and his office-bearers then carried out the Ceremony of Re-dedication in a most dignified manner that met with the approbation of the companions. After thanking the Grand 1st Principal and his office-bearers for carrying out the ceremony, the deputation from Supreme Grand Royal Arch Chapter of Scotland retired. Provincial Grand Superintendent MEC David Gibb, offered his thanks to the Queensferry Royal Arch Chapter for organising a first class event and wished the Chapter every happiness during the next 100 years. Provincial Grand Royal Arch Chapter then retired. The Chapter was duly closed and the companions retired to the Centenary Dinner where the usual toasts were pledged, replies delivered and a most happy day brought to a close with the Janitor’s Toast.